Everything you wanted to know about brakes and upgrading them for street, autocross, and track specifications. Rotors have slotted CNC machined into the rotor's face. Dimpled have, well, dimples - just like a golfball. Pros: This helps with de-gassing that brake pads under hard use. A thin layer of gas can form that can interfere with pad contact to the rotor. The idea here is the vein/slot/dimple will give an exit for the gas to escape/go. Cons: If you ever have pad material transfer (warping) on the rotor face you will not be able to turn the rotor surface (take off a thin amount of material to clear up pad transfer)*. Creates fissure points for the rotor to crack from. De-gassing is not often heard of anymore. *True for about 95% of the world. Some higher end shops (race shops) will be able to turn slotted rotors. Check area for availably. Recommendations: street use, autocross use, track use*. *Note: pad transfer can occur, not turning means wobbly braking. Use at your own discretion. Two variations - holes are a part of the rotors mold and holes where drilled into the rotor after it was molded. Typically, the molded with holes is more expensive, but it is better than having the rotors drilled after molding. And OE for some higher end cars (carbon ceramic is a different game here). Proper drilled rotors are $$$$$$. Pros: Supposedly helps with rotor cooling. However, today's, modern rotors, have venting veins in between the rotor faces. Cons: Rotors that are drilled after being molded can be weakened, structurally. Many HPDE event organizers will not allow cars with such rotors on the track. OE designed and drilled rotors can be very expensive. Recommendations: street use and autocross use. Just like the OE rotors. No modifications to the rotor face. Pros: Lots of contact in terms of rotor face to pad. Cons: If you think you are gassing the pads - no where for gasses to go. Gassing is not very common with modern pads and top manufactures. Recommendations: street use, autocross use, track use. 1-piece: Rotors/hat are molded as one complete piece. 2-piece: Rotors and hats are two separate pieces. 2-piece rotors do a better job of heat transferring, specifically, not transferring the heat back into the hat. They do carry a higher upfront cost over 1-piece rotors, but the benefit is that when a new rotor face is called for, you just have to change the rotor ring and not the whole assembly. 2-piece are also lighter by 3-4lbs thanks to hat material used. They also can expand and contract without interfering with the hat. 1-piece Pros: Cheaper, work well. Cons: Heat transferring at the limit. 2-piece Pros: Heat transferring control, weight savings. Cons: Costs. Two sections here - street and track. I am a big proponent to separating the two. Brakes are the line between you on the track and you flying off the track at the end of a straightaway. On the tracks, massive amounts of heat is generated. Street pads are just not designed to handle those levels of heat. 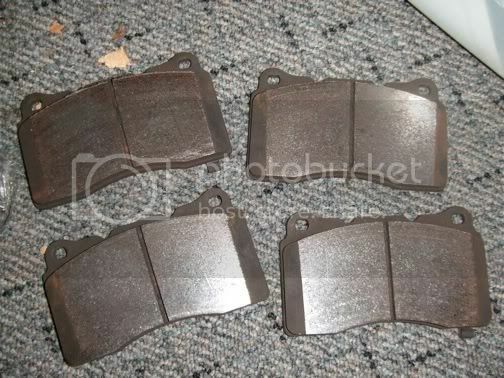 These are pads that are only meant to be run on the street or in autocross events. Again, they should never be taken out on the track. Their drag coefficients fall off quickly when past their operating temperature. These are pads that are only meant to be run on the track. Again, they should never be taken out on the street. They take some temperature to work right, without that temperature they might not work or have much stopping bite. Two levels to track pads - street tires and r-comp/slicked type tires. Generally, stickier tires (r-comps) means you will need more brake due to the increased levels of grip the tires will give you. They can and will overpower your pads. Also, more power equals more speed means the same ruling as r-comps. How much power? I can give myself as a reference. I make 340whpish, traps 116-117 in the quarter mile. I would say I am at the edge of street tire type pads (HT10's) – more on why in a bit. If you make over 350whp or trap higher than 120 in the quarter mile - moving to more aggressive pads might be a good idea. CL RC6E 0-1800F 0.46 drag coefficient Thanks 286bhp! CL RC6 0-1800F 0.5 drag coefficient (intermediate to high torque) Thanks 286bhp! - 10 stops from 30 mph to 10 mph at half braking power. Do not drag your pads during these stops. Drive for a few minutes. - 5 consecutive stops from 60 mph to 10 mph under hard braking. Once you're done. Drive home without using brakes as much as possible. Park car without the parking brake and let cool for at least 1 hour. 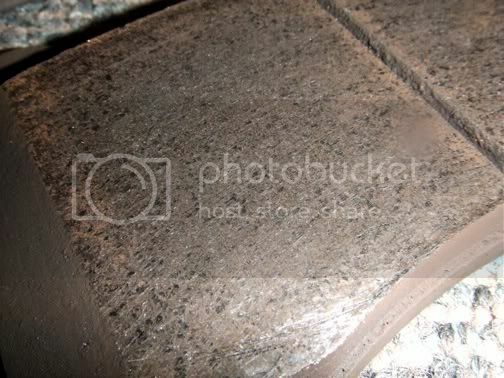 You may smell brake pads during bedding. Completely normal. These are brake lines that directly replace your original rubber/steel reinforced lines. The benefit here is not immediate, but consistency. In the past, OE rubber lines have been known to expand, leading to a squishy pedal, or worse, crack, leading to death. The Evo seems to have decent lines, no cracking events to my knowledge. But, hot lap after hot lap, the lines can start to get a heat transferred into them. The SS lines will not expand, this is where the consistency in pedal feel comes from. And now can be had for a reasonable cost. Not all SS lines are created equal. A few things, Goodridge lines had an advisory on how to install them right. Also, SS lines must be DOT approved. Techna-Fit carry the correct testing and certification. Lastly, VIII and IX lines can be different. IX owners - depending on where your car falls in the production line, you might have different fittings to the caliper. It seems late run IX's are slightly different than the VIII and early IX models. Sorry, I have no way of telling. But if you order a set and they don't fit - then get them exchanged for the correct fitting ones. A must for any autocross or track car, and not a bad idea at all for a street car. DOT4 resists boiling over in extreme usage (racing). Higher the dry/wet temperatures the better, but cost is a factor here, some can be very expensive. Fluids should be flushed at least every 2 years on a street only car. Brake fluid is hydrophilic – it literally loves water. Water becomes suspended within the fluid and lowers the temperature ranges. For track or autocross cars, the fluid should be changed/bleed much more often. Running the fluids at high temperatures does were it out over time. This can be seen in its color. Most fluids are a clearish color, after track or heavy autocross use they will go to amber and even black. On my car, again as a reference, I flush the fluids every spring to 100% fresh. Then bleed before any track days and every couple of autocross events. Typically, I track then run an autocross, then bleed – track day and so forth. 12 oz will do a bleeding, 24 oz for a flush, 36 oz for brakes and clutch lines. Chemistry Note: Look for something that contains boric acid or says it contains borates. These fluids will last longer because they keep the water from actually affecting the boiling point. These fluids scavenge water because they contain esters of boric acid. When water gets into the fluid, it hydrolyzes the ester into a long chain alcohol (normal brake fluid) and a boric acid unit (still has high boiling point). This will extend the life of the fluid in terms of water absorption. Brake duct cooling kits do exactly what they sound like – they cool the brake rotors with direct cool air. These are very beneficial on the track and even useful in autocross situations. A ducting kit can lower rotor temperatures by 20 to 30%. In example, I have infrared gunned my rotors after a session (and a cool down lap) at 900+F. So on the track, being pushed easily over 900F. So no ducts, temperatures would be around 1125F – after that cool down. *Note: This is why I say I am at the limit of my pads (1300F Max operating Temperature (MOT)). Thanks for reading and happy racing! Last edited by Smike; Jun 23, 2016 at 05:16 AM. Reason: Updated Smike's OP with fluid temps as a table for easier reading. Nice thread! Smike, I would link people to the Goodridge advisory in the stickies in case someone happen to pick up a set from an old batch. Also mention about DOT approval for lines. I know for sure the Techna-Fit lines are DOT approved. Thanks, done with some extra info too. I ended up going with the GS6's for my rears. Brake fluid comes in 12 ounce bottles. 1 bottle is good for bleeding, 2 should be sufficient for a flush, add a third bottle to do your clutch. That was in the brake fluid thread and I thought it should be posted here; I didn't know it, and thought it might help others. The ATE superblue seems to be the minimum recommended for trackdays, and that Brembo fluid has lower specs it seams. I will not make our right product recommendations, its up to the individual to decide their goals/needs, but I will post what I run. Amazing. Real good info, Mike! I wonder if GiroDisc can provdie the heat specs for their magic pads. Has there been any development with the IX ducting/brake cooling by anyone ? What d u mean by 'development?' There are a couple of different offerings from various companies. I will be installing the same ones SmikeEvo lists in this original post. The ACD pump is in the way for most of the "kits" on the IX.